STRIPPED Long before the Oscar streaker, David Niven shined in this unique film. 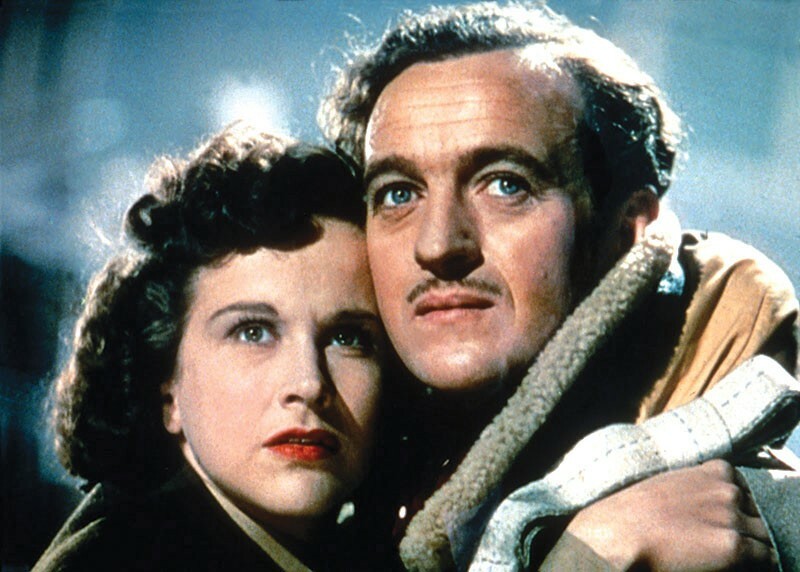 Time is up for group captain Peter Carter (David Niven), flying a flak-pierced, burning Lancaster during the last days of WWII, and when he makes a desperate jump over the Channel—after radioing a final farewell to a lovely WAC (Kim Hunter) in the control tower—he sets into motion the kind of SNAFU which the soldiers in that war were all too familiar with. The 1946 film A Matter of Life and Death, screening Jan. 31 at the Sonoma Film Institute, is also known as Stairway to Heaven. (Here at last is one movie that's as good as the song.) It's like the most elegant Twilight Zone episode ever made; the seeming quaintness of the theme is overcome by its balance of the sweet and the skeptical. This romance of a man caught between worlds is second only to The Wizard of Oz in the transition between glorious Technicolor and the black-and-white of the afterlife—a multiculti heaven that includes Sikhs and a statue of Mohammed. It anticipates It's a Wonderful Life, both in its celestial preamble and its aura of mourning for lost soldiers. Aside from its beauty as a romance, Life and Death has some of the same purposes of Shakespeare's Henry V: to remind ancestral enemies of the cause for which they jointly fought. The film needles Franco-British antagonism to make us appreciate Carter's spirit guide, a guillotined aristocrat played by the irresistible Marius Goring, master of the outrageous French accent. Director Michael Powell was once an area man, as The Onion puts it; he and his wife, the noted editor Thelma Schoonmaker, lived adjacent to San Quentin. Powell went out of style in the 1950s, before a revival he lived to appreciate. His influence is everywhere in the flowering of British cinema from the 1960s on: Derek Jarman, Peter Greenaway, Ken Russell, Nicolas Roeg on the avant-garde side; the adventures of the death-defying 007 on the other. 'A Matter of Life and Death' screens Friday, Jan. 31, and Sunday, Feb. 2, at the Sonoma Film Institute. Warren Auditorium, SSU, 1801 E. Cotati Ave., Rohnert Park. Jan. 31 at 7pm; Feb. 2 at 4pm. $5–$7. 707.664.2606.